The roles and responsibilities of a Server developer are crucial for tech companies as these developers are responsible for creating, designing and maintaining computer databases. 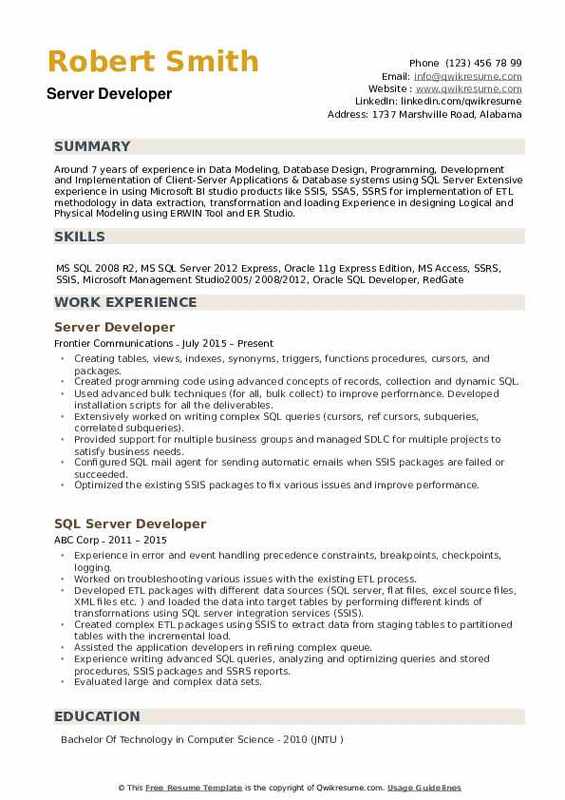 A Well-crafted Server Developer resume mentions job duties such as – writing codes, developing and designing SQL applications, ensuring performance and availability of database, handling common procedures such as backup, migration, upgrade, recovery, etc; preparing specifications and documentation, updating information in database, collaborating with other team members and stakeholders and finally ensuring security. 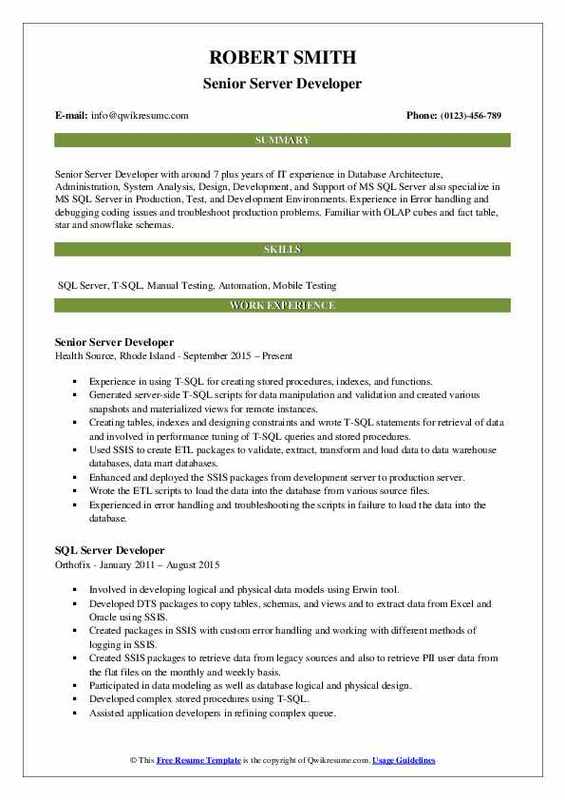 Qualities normally expected from a server developer includes SQL database knowledge, experience in modern relational databases, knowledge of best practices, proficiency in code versioning tools like Git, SVN or Mercurial; and capabilities to troubleshoot and resolve common database issues. Eligible candidates may apply for this job role by holding a Bachelor’s degree in the field of IT or Computer Science to their credit. Summary : SQL Server Developer with over 10+ years of experience in Design, Development & Analysis of SQL Server and SQL Server Business Intelligence Tools (BIDS) - SSIS, SSRS, and SSAS. Experience with Installing, Configuring, Managing, Upgrading, Migrating, Monitoring and Troubleshooting. SQL Server Development and Administration experience on Database Design and Implementation of OLTP and OLAP environment using SQL server. Designed and implemented snapshots report, report subscription, data-driven subscription and report caching using report manager. Generated SSRS reports which included various reporting features such as groups, sub-groups, adjacent-groups, group by total, group by sub-totals, grand-totals, drill down, drill through, sub-reports, navigation reports. Created parameterized reports like standard parameter reports, cascading parameter reports which consist of report criteria in various reports to make minimize the report execution time and to limit the no of records required. Reporting parameters included single-valued parameters, multi-value parameters which also consist of different parameter types like hidden, internal and default like queried and non-queried. Created linked reports, ad-hoc reports based on the requirement. Linked reports are created in the report server to reduce the repetition in the reports. Created subscriptions to provide reports on a daily / weekly /monthly / quarterly and annual basis. Created stored procedures to validate the data coming with different data discrepancies using data conversions. Created subreports, bar chart, matrix reports, parameterized reports, cross-tab reports, drill down reports & summary reports for newly created markets. 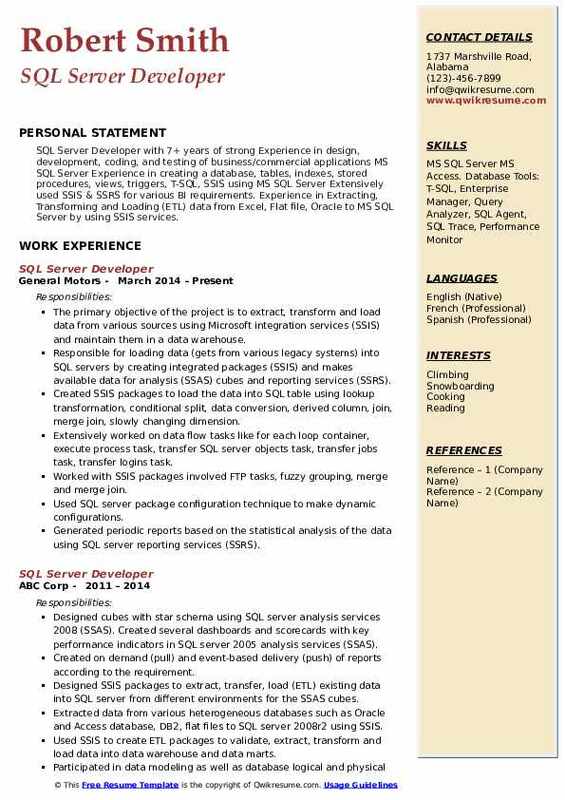 Headline : Server Developer around 6 years of experience in IT industry as a SQL Server Developer with specialized skills in SSIS, SSAS, and SSRS Expert in MS SQL Server and Business intelligence (SSIS, SSRS, SSAS). Highly proficient in the use of T-SQL for developing complex Stored Procedures, Triggers, Tables, User Defined Functions, Views, Indexes, User profiles query writing and SQL joins. 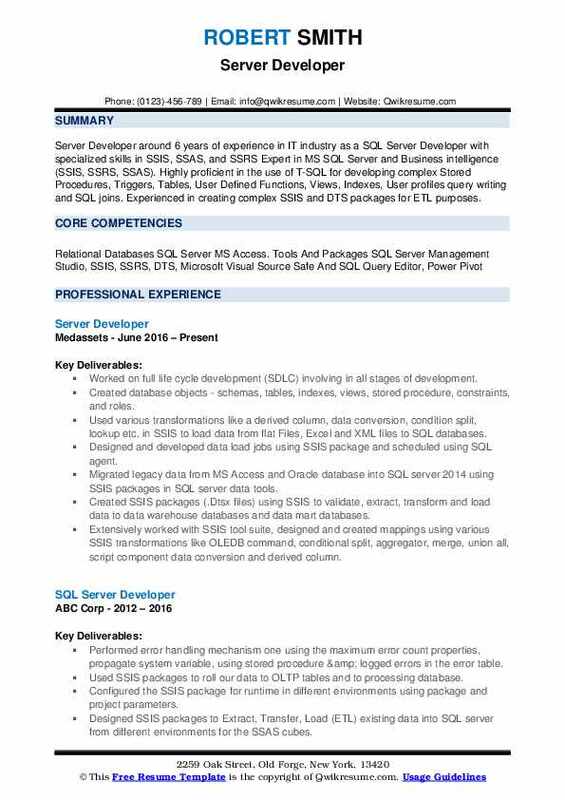 Experienced in creating complex SSIS and DTS packages for ETL purposes. Worked on full life cycle development (SDLC) involving in all stages of development. Created database objects - schemas, tables, indexes, views, stored procedure, constraints, and roles. Used various transformations like a derived column, data conversion, condition split, lookup etc. in SSIS to load data from flat Files, Excel and XML files to SQL databases. Designed and developed data load jobs using SSIS package and scheduled using SQL agent. Migrated legacy data from MS Access and Oracle database into SQL server 2014 using SSIS packages in SQL server data tools. Created SSIS packages (.Dtsx files) using SSIS to validate, extract, transform and load data to data warehouse databases and data mart databases. Extensively worked with SSIS tool suite, designed and created mappings using various SSIS transformations like OLEDB command, conditional split, aggregator, merge, union all, script component data conversion and derived column. 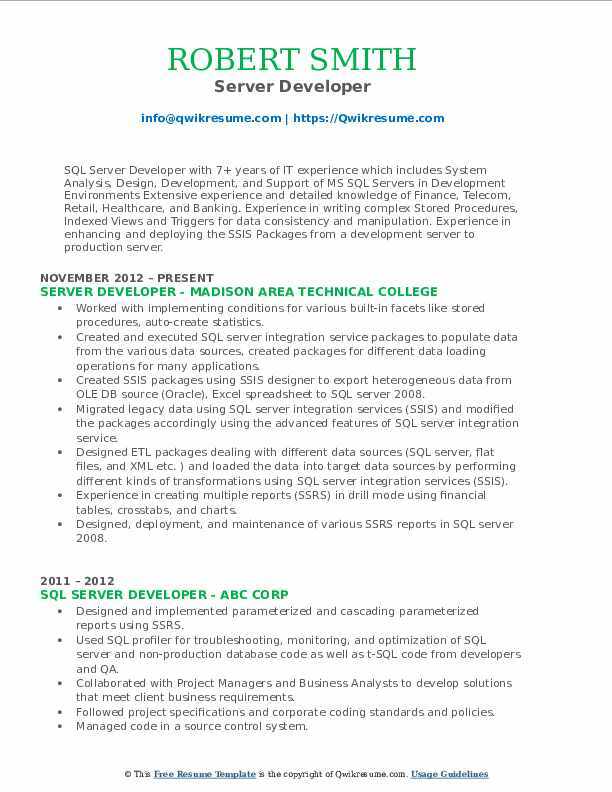 Summary : Senior Server Developer with around 7 plus years of IT experience in Database Architecture, Administration, System Analysis, Design, Development, and Support of MS SQL Server also specialize in MS SQL Server in Production, Test, and Development Environments. Experience in Error handling and debugging coding issues and troubleshoot production problems. Familiar with OLAP cubes and fact table, star and snowflake schemas. Experience in using T-SQL for creating stored procedures, indexes, and functions. Generated server-side T-SQL scripts for data manipulation and validation and created various snapshots and materialized views for remote instances. Creating tables, indexes and designing constraints and wrote T-SQL statements for retrieval of data and involved in performance tuning of T-SQL queries and stored procedures. Enhanced and deployed the SSIS packages from development server to production server. Wrote the ETL scripts to load the data into the database from various source files. Experienced in error handling and troubleshooting the scripts in failure to load the data into the database. 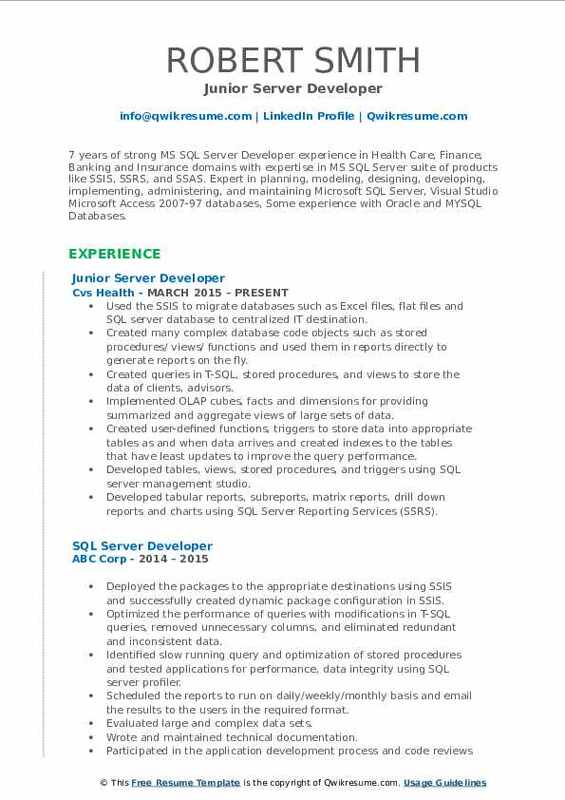 Objective : 7 years of strong MS SQL Server Developer experience in Health Care, Finance, Banking and Insurance domains with expertise in MS SQL Server suite of products like SSIS, SSRS, and SSAS. Expert in planning, modeling, designing, developing, implementing, administering, and maintaining Microsoft SQL Server, Visual Studio Microsoft Access 2007-97 databases, Some experience with Oracle and MYSQL Databases. Used the SSIS to migrate databases such as Excel files, flat files and SQL server database to centralized IT destination. Created many complex database code objects such as stored procedures/ views/ functions and used them in reports directly to generate reports on the fly. Implemented OLAP cubes, facts and dimensions for providing summarized and aggregate views of large sets of data. Created user-defined functions, triggers to store data into appropriate tables as and when data arrives and created indexes to the tables that have least updates to improve the query performance. Developed tables, views, stored procedures, and triggers using SQL server management studio. Developed tabular reports, subreports, matrix reports, drill down reports and charts using SQL Server Reporting Services (SSRS). Created various SSIS packages to transfer data from OLTP databases to the staging area and then into the data warehouse. 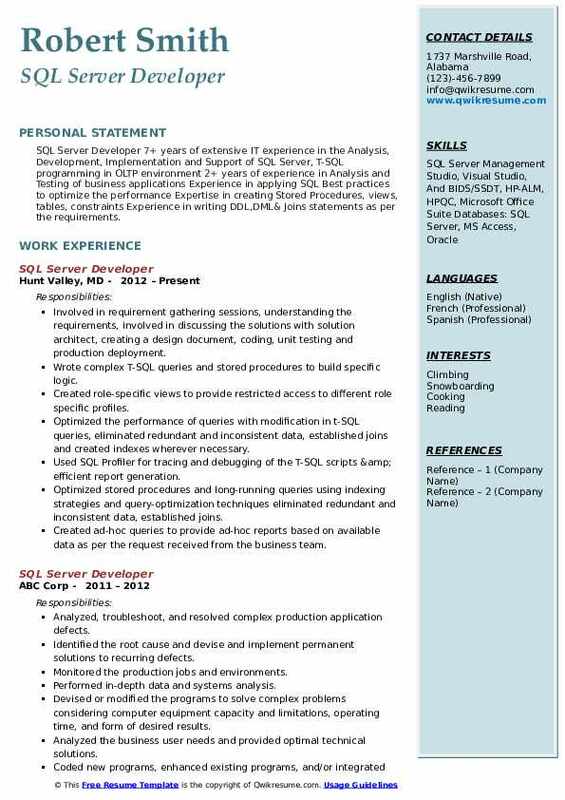 Summary : SQL Server Developer 7+ years of extensive IT experience in the Analysis, Development, Implementation and Support of SQL Server, T-SQL programming in OLTP environment 2+ years of experience in Analysis and Testing of business applications Experience in applying SQL Best practices to optimize the performance Expertise in creating Stored Procedures, views, tables, constraints Experience in writing DDL,DML& Joins statements as per the requirements. Involved in requirement gathering sessions, understanding the requirements, involved in discussing the solutions with solution architect, creating a design document, coding, unit testing and production deployment. Wrote complex T-SQL queries and stored procedures to build specific logic. Created role-specific views to provide restricted access to different role specific profiles. Optimized the performance of queries with modification in t-SQL queries, eliminated redundant and inconsistent data, established joins and created indexes wherever necessary. Used SQL Profiler for tracing and debugging of the T-SQL scripts & efficient report generation. Optimized stored procedures and long-running queries using indexing strategies and query-optimization techniques eliminated redundant and inconsistent data, established joins. Created ad-hoc queries to provide ad-hoc reports based on available data as per the request received from the business team. Created SDS documents for implementing the client specified requirements. Communicated effectively with business users to identify current reporting procedures and clarify program objectives. Summary : SQL Server Developer with overall 8 years of IT Experience with SQL Server Developer, Database and Business Intelligence Technologies with expertise on ETL process and Reporting using SQL Server SSIS, SSAS, and SSRS. Extensive experience in implementing SSIS, SSRS using Microsoft Business Intelligence development studio (MSBI) and SQL Server data tools (SSDT). Experience in Creating and Updating Clustered and Non-Clustered Indexes to keep up the SQL Server Performance. Involved in creating functional and technical specification documents after gathering requirements from the business. Created database objects like tables, views, stored procedures, functions, joins, and indexes in T-SQL based upon the functional specifications. Designed and developed data models (physical/logical data models) based on the given specs. Developed complex T-SQL queries and SQL scripts for efficient data load based on complex business rules. Designed complex ETL strategies to pull data from different sources, like SQL Server, Oracle, and flat files and load it to the destination database after using multiple transformations. Experience in writing SQL queries for pulling a large volume of records from facets and claims database using stored procedures, and extraction transformation and loading (ETL) process using SSIS. Experience in migrating databases from one environment to another environment using linked servers. Designed and developed reports using report builder to easily generate reports by the user. Configuring SSIS packages using package configuration wizard to allow packages run on different environments. 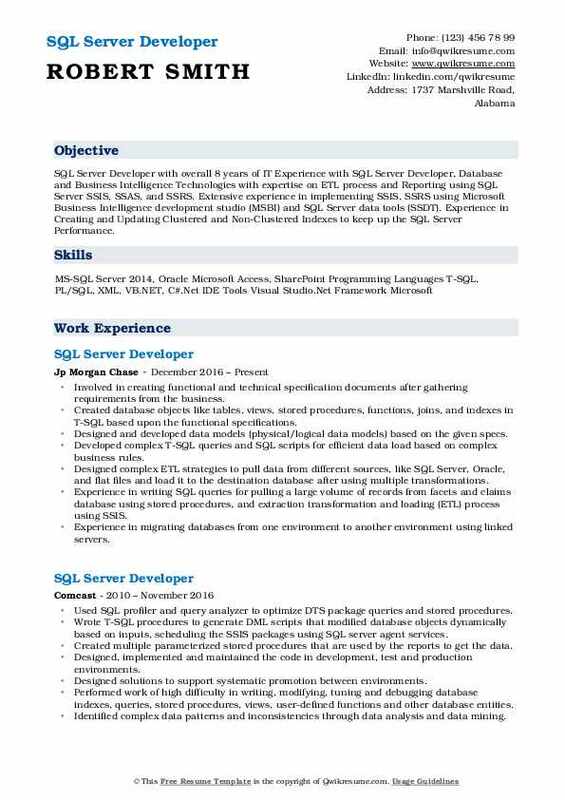 Summary : SQL Server Developer with 7+ years of IT experience which includes System Analysis, Design, Development, and Support of MS SQL Servers in Development Environments Extensive experience and detailed knowledge of Finance, Telecom, Retail, Healthcare, and Banking. Experience in writing complex Stored Procedures, Indexed Views and Triggers for data consistency and manipulation. Experience in enhancing and deploying the SSIS Packages from a development server to production server. Worked with implementing conditions for various built-in facets like stored procedures, auto-create statistics. Created and executed SQL server integration service packages to populate data from the various data sources, created packages for different data loading operations for many applications. Created SSIS packages using SSIS designer to export heterogeneous data from OLE DB source (Oracle), Excel spreadsheet to SQL server 2008. Migrated legacy data using SQL server integration services (SSIS) and modified the packages accordingly using the advanced features of SQL server integration service. Designed ETL packages dealing with different data sources (SQL server, flat files, and XML etc. ) and loaded the data into target data sources by performing different kinds of transformations using SQL server integration services (SSIS). Experience in creating multiple reports (SSRS) in drill mode using financial tables, crosstabs, and charts. Designed, deployment, and maintenance of various SSRS reports in SQL server 2008. 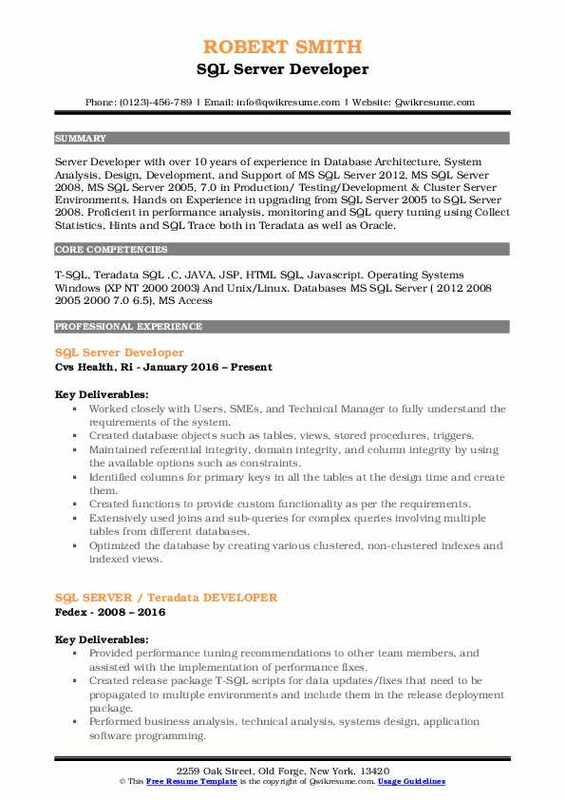 Summary : Server Developer with over 10 years of experience in Database Architecture, System Analysis, Design, Development, and Support of MS SQL Server 2012, MS SQL Server 2008, MS SQL Server 2005, 7.0 in Production/ Testing/Development & Cluster Server Environments. Hands on Experience in upgrading from SQL Server 2005 to SQL Server 2008. Proficient in performance analysis, monitoring and SQL query tuning using Collect Statistics, Hints and SQL Trace both in Teradata as well as Oracle. Worked closely with Users, SMEs, and Technical Manager to fully understand the requirements of the system. Created database objects such as tables, views, stored procedures, triggers. Maintained referential integrity, domain integrity, and column integrity by using the available options such as constraints. Identified columns for primary keys in all the tables at the design time and create them. Created functions to provide custom functionality as per the requirements. Extensively used joins and sub-queries for complex queries involving multiple tables from different databases. Optimized the database by creating various clustered, non-clustered indexes and indexed views. Increased the performance necessary for statistical reporting by 25% after performance monitoring, tuning and optimizing indexes. Used various SSIS tasks such as conditional split, derived column, which was used for data scrubbing, data validation checks during staging, before loading the data into the mart tables. Experience in error and event handling, precedence constraints, breakpoints, checkpoints, and logging. 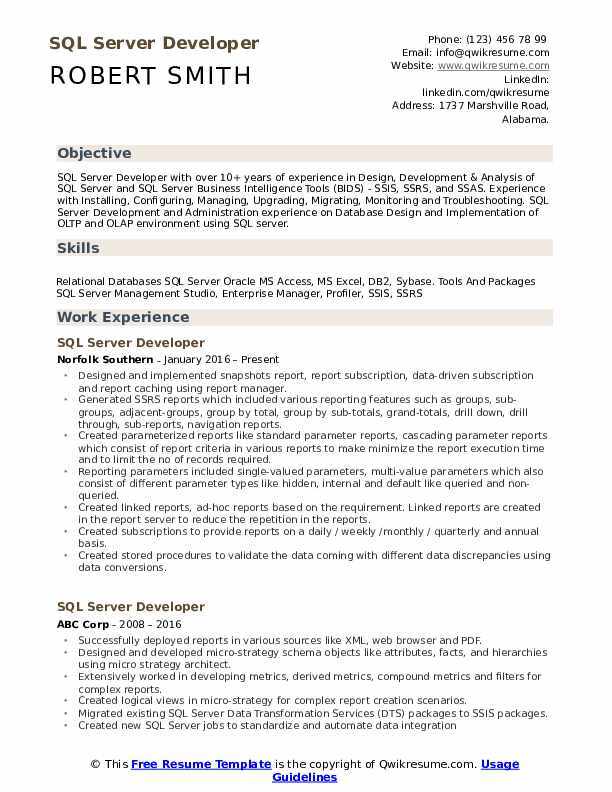 Summary : SQL Server Developer with 7+ years of strong Experience in design, development, coding, and testing of business/commercial applications MS SQL Server Experience in creating a database, tables, indexes, stored procedures, views, triggers, T-SQL, SSIS using MS SQL Server Extensively used SSIS & SSRS for various BI requirements. Experience in Extracting, Transforming and Loading (ETL) data from Excel, Flat file, Oracle to MS SQL Server by using SSIS services. The primary objective of the project is to extract, transform and load data from various sources using Microsoft integration services (SSIS) and maintain them in a data warehouse. Responsible for loading data (gets from various legacy systems) into SQL servers by creating integrated packages (SSIS) and makes available data for analysis (SSAS) cubes and reporting services (SSRS). Created SSIS packages to load the data into SQL table using lookup transformation, conditional split, data conversion, derived column, join, merge join, slowly changing dimension. Extensively worked on data flow tasks like for each loop container, execute process task, transfer SQL server objects task, transfer jobs task, transfer logins task. Worked with SSIS packages involved FTP tasks, fuzzy grouping, merge and merge join. Used SQL server package configuration technique to make dynamic configurations. Generated periodic reports based on the statistical analysis of the data using SQL server reporting services (SSRS). Involved in creating calculated members, named set, advanced KPIs for the SSAS cubes. Summary : Around 7 years of experience in Data Modeling, Database Design, Programming, Development and Implementation of Client-Server Applications & Database systems using SQL Server Extensive experience in using Microsoft BI studio products like SSIS, SSAS, SSRS for implementation of ETL methodology in data extraction, transformation and loading Experience in designing Logical and Physical Modeling using ERWIN Tool and ER Studio. Creating tables, views, indexes, synonyms, triggers, functions procedures, cursors, and packages. Created programming code using advanced concepts of records, collection and dynamic SQL. Used advanced bulk techniques (for all, bulk collect) to improve performance. Developed installation scripts for all the deliverables. Extensively worked on writing complex SQL queries (cursors, ref cursors, subqueries, correlated subqueries). Provided support for multiple business groups and managed SDLC for multiple projects to satisfy business needs. Configured SQL mail agent for sending automatic emails when SSIS packages are failed or succeeded. Optimized the existing SSIS packages to fix various issues and improve performance. Designed new SSIS packages to extract data from newer OLAP and OLTP sources and transferred the data to SQL server using bids. Responsible for SQL running using explain plan, optimizer hints. Involved in RDBMS design and developed er-diagrams using Erwin. Participated in code walkthroughs and review sessions with the development team.